Is it possible to see the combination of red and green together without automatically thinking of Christmas? Eating red and green together, unfortunately, is seen far less often than the colors of the holiday pageantry. Green foods are easy to find any time of year, but not so much for red-tinged foods. Fortunately, the reddest food I can possibly imagine also happens to be coming into season at precisely this same time that Santa starts making appearances at the mall. I'm speaking of the pomegranate, that bulbous red orb that is notoriously intimidating to break apart and eat. The pomegranate has gotten fantastic press in the last few years, due to its high antioxidant levels. It was one of the first edibles actually given the marketing moniker "superfood." The lore and lure of this ancient fruit goes far beyond its purported health properties, however. Pomegranates originated in the Middle East and are far more likely than apples to be that red tree fruit Eve brought to Adam in the Garden of Good & Evil. All Biblical and historical accounts aside, the pomegranate even today is associated with luck and fertility in its ancestral areas of the world. There is no denying that busting apart a pomegranate for the first time leaves one with a the feeling... "Ok, now what?" The interior of the fruit is made up of a network of waxy white pith, surrounding hundreds of juicy nuggets of sweet and sour deliciousness. These individual seeds are the only edible bits of the pomegranate (they can also be pressed for juice). The seeds are called arils, and although they can be purchased, pre-cleaned, in a nice neat package, there is something quite fun about doing the dirty work yourself. For me, it is a holiday tradition to round up some kids to help pick apart a pomegranate, popping seeds in our mouths as we go. The best way to deconstruct a pomegranate that I have found is to cut it straightaway into quarters, being wary of squirting juices, of which there will be plenty. Plunk the quarters into a large bowl of water, then start peeling the white pith away and pry the individual seeds free. The seeds are tightly wedged against each other, and after the first few seeds in each section fall away, lots more will easily pop out. The pith will float to the top of the water and the seeds will sink as you go. Pour away the water (and the floating white debris) and you will be left with a bowl full of winter's natural red candy. Each aril contains a small crunchy seed, which is totally edible. In fact, it is that texture of the seed, along with the juice that surrounds it, that makes eating pomegranates so addictive. Pomegranate arils are eaten raw and any dish you choose to sprinkle these festive little red holiday baubles over will be instantly holiday-ready. Toss them in your yogurt. Sprinkle them on ice cream or over any dessert to add a pop of sour. Throw them on a salad to up the ante of sweetness and add a pleasing crunch. I especially like them as a garnish on warm savory dishes. Adding pomegranate to a rice pilaf transforms an ordinary side dish into a jeweled beauty, especially when coupled with some chopped herbs for a festive red/green contrast. 9. Dig in while it's warm, because this is seriously gooooood! 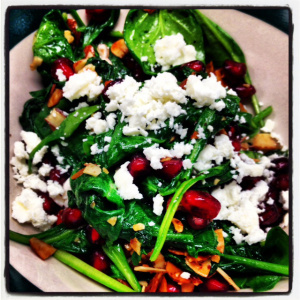 This dish is based on a classic Spanish dish of sauted spinach with raisins and pinenuts. I love this original as well, and if you are feeling indulgent, feel free to swap out the almonds with pinenuts, toasted the same way. This recipe is a great side with some roasted chicken or fish and rice pilaf for a delicious dinner. As part of a holiday buffet spread, this dish's sheer beauty will tempt even spinach naysayers. For me, the winter holidays are all about celebrating once-a-year specialties, be that holiday family traditions, holiday music, or holiday foods. Pomegranates aren't going to be around for long, and if you have not yet tried them, then 'tis the season!